The InfoPrint 6500-V5P and 6500-V05 are cost-efficient, high-speed print solutions! 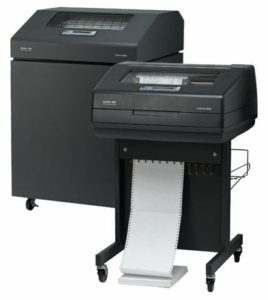 The InfoPrint 6500-V5P and 6500-V05 line matrix printers, with its state-of-the-art print engine and controller technology, allow you to confidently meet the demands of back office and/or data processing applications. With its powerful remote management capabilities, you can maximize printer utilization. The IBM InfoPrint 6500-V05 AND V5P is an extremely versatile, cost-effective printer. It can be attached via Ethernet, wireless Ethernet, Telnet, ASCII, coax, or twinax to such diverse hosts as the IBMiSeries™, zSeries®, and pSeries® servers, IBM PC and Netfinity® servers, IBM-compatible PCs, non-IBM systems supporting the ASCII serial or parallel interface, and LANs. Key Prerequisites – Wireless Ethernet, LAN Ethernet, coax, twinax, and ASCII attachments allow the IBM InfoPrint 6500 V05 AND V5P to be used on virtually all IBM, as well as many non-IBM, platforms. The IBM InfoPrint 6500 family has models with maximum print speeds from 500 to 2,000 lpm, and with an array of features that can be used to customize the printer for many applications and attachments. The breadth of the InfoPrint 6500 family offers common features across the range of printer speeds. When ordered with one of the following LAN or wireless Ethernet interfaces (#4177, #5180, #4542, #4544, or #4545), the InfoPrint 6500 natively supports the IBM Printer Management Utility (PMU). This utility provides a database from which the user can have real-time visibility to printer status and ribbon life for every InfoPrint 6500 and 6700 installed on their network. Using the database, a remote user can quickly create master configurations, and then download them to multiple printers simultaneously. If microcode updates are required, the PMU also enables new microcode to easily be downloaded to multiple printers. If a simple configuration change is required, or for problem determination, the PMU allows the use of a virtual operator panel, thereby providing the operator with complete control over the printer. The Print Management Utility also provides proactive printer monitoring by immediately notifying the appropriate operators when assistance is required. At the moment an alert occurs, a message indicating the type of alert is sent via e-mail to the specific operator tasked with resolving that class of alert. For example, when a “ribbon low” alert is generated by a printer, an e-mail will be sent to the person responsible for installing new ribbons on the printer. Operational commonality – You can operate the InfoPrint 6500 Models v5P, v05, v1P, v10, V05 and V5P, and V05 AND V5P in much the same way as the previous IBM 6400 models. These models demonstrate a commonality in areas such as loading and unloading of forms, and the availability of coax, twinax, Ethernet, Code V, IGP, IPDS, Proprinter III XL, Epson FX 1050, Printronix P-Series, and Printronix P-Series XQ Variant emulations.